A steam engine pulling a mail car and passenger cars over the Pudding Creek Trestle! Unless you visit the model train layout at the Botanical Gardens! Various aspects of railroading in Mendocino County are recreated in G scale. when we Walked the Skunk. All constructed and operated by a nice bunch of folks. The layout is outdoors and solar powered! It is well worth a visit along with the rest of the Gardens. I was able to look down from the Highway One bridge upon this Osprey looking down on the Noyo Harbor estuary for breakfast. For those of you hunting for space for your business I photographed this morning what's available on Franklin Street in the one block between Redwood Ave and Laurel Street. Like they say, "Find a need and fill it". Our cool summer continues while inland has a heatwave. Seattle too, according to my brother. I happened upon this Stone Cold Killer along Harold Street. I wonder what the victum was. I'm happy to see this Citroen 2CV back in town. I'm not sure what year it is but here is the 1978 version from Wikipedia. If this one is that old it sure is in good shape. a whole lot of building! This building is left over from the heyday of radio and this was thee AM station on the coast! Now it just sits there, unattended and automated. A couple boys watching me walk by. Of course I was entertaining them with odd clicks, clucks and soft whistles to hold their attention!! Well..., it was so foggy it misted my glasses during my walk this morning but I'm not complaining. The weather man is predicting 104 for Ukiah and Willits today and 107 for Covalo! Fort Bragg? The mid 50's!! I got to noticing color themes this morning. I wonder if anyone planned these schemes or if it is just happy happenstance. I caught this one in the s-l-o-w process of crossing it's former path. Getting my nose close to the scene I can see how it "putt-putts" along in a stately manner and how each spot takes a few minutes to dry into a shiny slime dot but why the intermittent spacing? I may have to ask Phil at Beyond the Human Eye. This is my six hundredth WalkingFortBragg post!! I see via Google Analytics I have around 60 readers per day! I'm having fun and obviously you are too so, onward with this walking and gawking thing! Remember this photo from last month? Well, the paint job is pretty much done. It looks like there is just the mailbox to put back on the post! Nice! Yesterday I got a sneak peek inside the Fort Bragg Bakery. Here is one side of the new wood fired pizza oven. There are bricks included in this structure that arrived in Fort Bragg as ballast in the bottom of returning lumber ships; Redwood lumber to San Francisco, brick ballast on the return trip for stability. Some of the bricks have the name of their manufacturer molded in them. All new equipment, walls, floors and ceiling. Fort Bragg Bakery is really going to be something special! The photos I took from this intersection July 21st were taken at 6:15 in the morning. These were taken at 10:30 in the morning. The sun does burn through and the streets do come alive! Wait till you see it at 3:30 in the afternoon!! Meanwhile, the new signage at the bakery is complete. Note the "Est. 1909". Yes, this whole section of Franklin Street burned to the ground during the 1906 Earthquake, yes, the same quake that leveled most of San Francisco. This, and other buildings in this area were up and running again by 1909. I don't know if this building has always housed a bakery though. One of you old-timers might leave a comment. The new bakery is getting its sign. I see Rossi's has been repainted and is sporting a new sign. 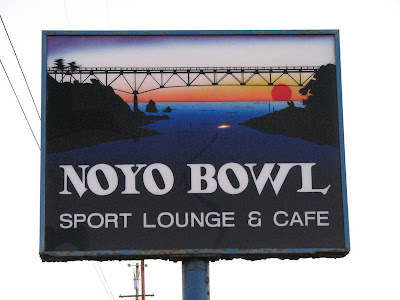 Noyo Bowl has a new sign that has the new Highway One bridge as part of its graphic. Here's a photo I took of the former sign with the former Highway One bridge. I walked out the Haul Road this morning enjoying the Marine Layer. I never thought I would say that but it is bloody hot inland. I saw folks at the motel just north of the Pudding Creek Bridge sitting out in lawn chairs and soaking in the cool air and moisture. I asked them where they were from. 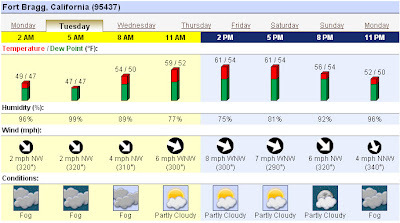 Coastal forecast high of 61 degrees. 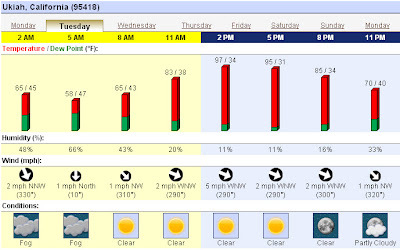 Inland forecast high of 97 degrees. Looking North from the intersection of Redwood and Franklin at 6:15 this morning. Looking South from the same intersection.